The Golden Retriever is by far one of the most well known dog breeds around the world, and also one of the most widely adopted. 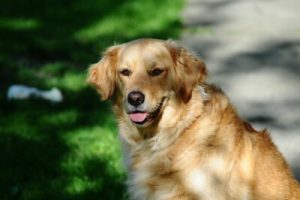 When determining if a Golden Retriever is right for your family and lifestyle, be sure to read more about them, and get to know Goldens. The Golden Retriever is generally light yellow to deep golden honey in color. Their fur tends to get deeper in colour after their first year, often it may turn almost orange. Goldens tend to be about 24 inches tall; females being slightly shorter. Their coat should be long and either flat or wavy. Goldens need to be brushed regularly and properly or their coat will form thick mats, thus needing to go to the groomers often. The Golden Retriever was bred to be tough and strong. But don’t let their happy nature or silly face fool you, they’re brilliant dogs that can bring a lot of love into your life. While any Golden will delight in lazing around the house or wrestling on the floor with your family, the breed is particularly amazing outdoor animals. As puppies, Golden Retrievers are full of boundless energy. It’s a good idea to get in with a playgroup or doggy daycare near you. Golden Retriever puppies aren’t fussy and don’t discriminate; so a chair leg works as well for them as a sterilized bone. Goldens are very smart, very trainable, athletic, and good-natured. They have a keen desire to please and you can find them performing with tails wagging and eyes shining in the obedience, agility, and fly ball arenas. Golden Retriever are in the Sporting Group of the American Kennel Club. This sporting group is made up of some of the oldest and most popular breeds. Goldens are natural retrievers, so you can enjoy them fetching a stick, a tennis ball or other object for what seems like forever. Another trait is their outgoing personality, making sporting dogs enthusiastic and responsive partners. If you are looking for a loyal companion that will be great with kids or adults, you should definitely find a local breeder or visit a shelter to adopt and spend some time getting to know a Golden. Want to get to know a Golden Retriever who was the Dog Day Getaway Dog of the Month November 2016; read about Waffles!